About one-third of our food supply relies on pollination by honey bees, native bees, butterflies, beetles, and flies. If pollinators disappear, so will squash and watermelon, along with many of the other foods we love. Unfortunately, pollinator populations are not as healthy as they used to be. Pollinators face pesticides, habitat loss, pathogens, parasites, and more challenges every day. The good news is that it’s easy to provide habitat for pollinators. 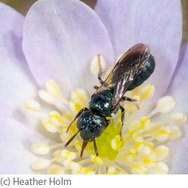 Crystal Boyd, a bee specialist with the DNR's Minnesota Biological Survey, says that even a few square feet of native flowering plants in a yard, park, roadside ditch, or condo balcony can make a difference. So let’s get planting! Plant a wide variety of native, flowering plants. Bees survive on flowers, which supply them with nectar and pollen. Providing a variety of plants will support more bee species. Early season blooms, like willow or maple, provide food for pollinators when other options are scarce. Fall blooming plants, like goldenrod and aster, are important for pollinators looking for food before winter. Check out this list of Plants for Minnesota Bees from the University of Minnesota Bee Lab. They’ve identified plants that are particularly attractive to bees and can be easily integrated into most landscapes. Bee-friendly plants grow in small spaces too. If your growing space is limited, consider growing pollinator plants in containers. The Native Plants and Wildlife Gardens blog has good suggestions for growing native plants in containers and creating habitat containers. Reduce or eliminate pesticide use. Avoid buying plants treated with neonicotinoids or other systemic insecticides, which remain present in the leaves, pollen, and nectar of the plant. Ask your local nursery or retailer which plants are neonicotinoid-free. Once at home, keep your plants free of contact insecticides. Many plant pests cause only temporary, aesthetic problems that can be managed or tolerated. If you do use insecticides, read the label and follow directions. 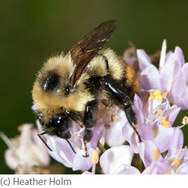 The US EPA has developed new pesticide labels that help you understand how to apply the pesticides and help protect bees. Provide shelter. Most of Minnesota’s approximately 400 bee species are solitary, living in nests in the ground or in cavities in stems or trees. 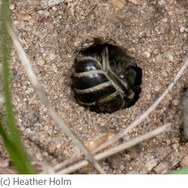 You can attract ground-nesting bees by leaving undisturbed, sandy soil in your yard. 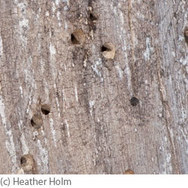 For the cavity-nesting bees, you can make a bee house. It’s fun and easy! The University of Minnesota Bee Lab provides how-to instructions in their Wild Bees and Building Wild Bee Houses publication (pdf). Don't forget water. Provide a fresh water source like a bird bath, pond, or fountain. Refresh your standing water once a week to eliminate mosquito larvae. When it doubt, dump it out! Be a citizen scientist. The University of Minnesota Monarch Larva Monitoring Project is an exciting way for monarch and nature enthusiasts to contribute basic knowledge about monarch population dynamics and foster monarch and habitat conservation. The University of Minnesota Bee Lab: Research for the health of bee pollinators. Pollinators of Native Plants: Local author with book, blog, and free downloadable posters. The Minnesota DNR: List of native plant suppliers and landscapers in Minnesota. The Beez Kneez education program: Experiential education about honey bees. The Friends School Plant Sale is held Mother's Day weekend at the Minnesota State Fair Grandstand with 2,300 varieties of plants, including native plants and pollinator talks, May 9-11 (St. Paul). The Landscape Revival--Native Plant Expo & Market offers gardeners one convenient location to shop for Minnesota native plants from 12 local native growers and learn how to use the plants from eight conservation organizations, June 7, 9 a.m. to 3 p.m., Rainbow Foods Community Pavillion (Roseville). Discover the plants and animals that sweeten the world through pollination at the Pollination Celebration, June 21, 10 a.m.-2 p.m., Cascade Meadows Wetlands and Environmental Science Center (Rochester). Join in Minneapolis Park and Recreation Board’s Pollinator Party, July 24, 5 to 8 p.m. Lyndale Park Gardens (Minneapolis). Field Outdoor Spaces will be showcasing pollinators in the garden at the 2014 Eco Experience at the Minnesota State Fair, including demonstrations and talks at noon daily, August 21 to September 1, 9 a.m. to 9 p.m., Minnesota State Fair grounds (St. Paul). 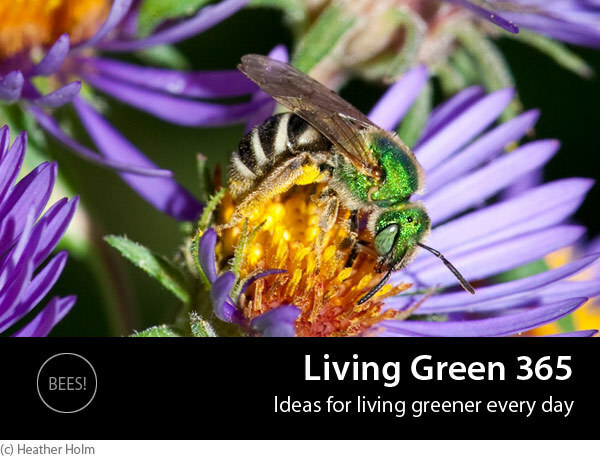 Thank you for reading Living Green 365. This newsletter is a publication of the Minnesota Pollution Control Agency. Please send questions or comments about living green to the address below.